Every day, we are bombarded with a range of stimulus we must review in order to engage with the world around us. To this end, communication materials are often designed to either catch our attention (i.e., make us use them) and convey an idea (i.e., foster comprehension). To date, however, little research has examined both the abilities for a given visual design to catch our attention and foster effective comprehension. This proposed project would use a three part method to gather the qualitative and the quantitative data needed to asses how well different approaches to design address aspects of both attention and comprehension within the context of the same document. By researching this topic, this project can contribute to a number of fields – medical communication, technical communication, document design, etc. – that focus on conveying specialized/technical information to lay audiences. Data visualization is using visuals to present large amounts of data according to certain parameters or categories (e.g., the collection of data into charts, graphs, or scatter plots). Information design is the overall appearance of the page (or screen) that includes data visualization, accompanying explanatory text, headings, and other layout features to present a more comprehensive message. 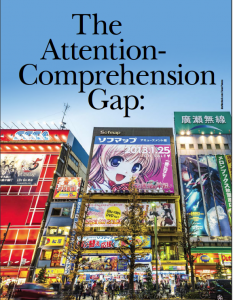 Attention Comprehension Gap is the gap between a communiqué’s ability to draw an individual’s attention to information and the reader’s ability to comprehend that information. In a well-designed artifact, the gap between attracting a person’s attention and the individual’s ability to comprehend ideas is small to non-existent. 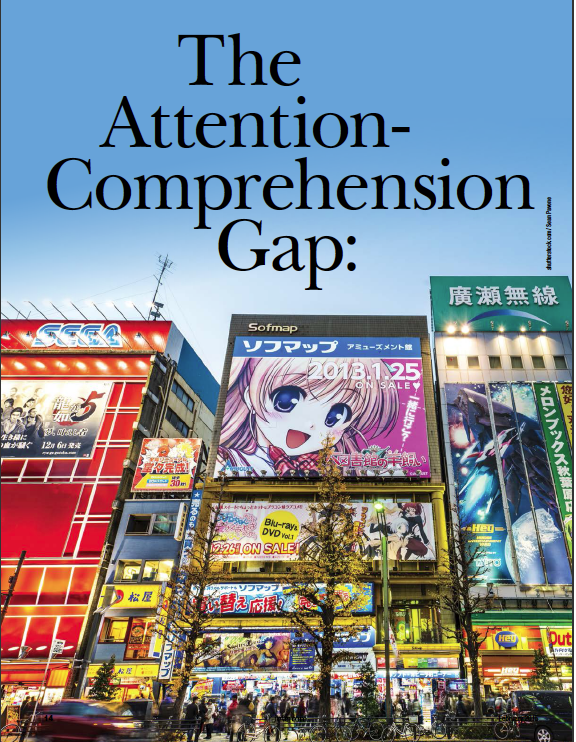 The bigger the gap, the more likely it is the reader will not comprehend the information (St.Amant & Meloncon, 2015). Currently, information design research is dispersed across a range of fields making it difficult to build a coherent body of scholarship that could lead to best practices. Much research either focuses on attention or on comprehension (see Lipkus, 2007; Neuner-Jehle, et. al., 2011; Sha & Freedman, 2011). Communication researchers (Houts, 2006) have, in turn, examined improving the visual nature of health communication, but they, too, do not address attention and comprehension simultaneously. Though theorists have posited ways to create visualizations of complex information (see Hegarty, 2011; Schriver, 1999; Tufte, 2001) researchers have failed to empirically test these theories with potential users of the data (Kimball, 2013). What types of documents gain readers’ attention? How do we assess participants’ comprehension of the information in a document? While visuals help draw attention and aid in comprehension, “inappropriate information formats are often used” (Gigerenzer, et. al., 2008, p. 52-53), which led us to the notion of usability, or “the degree to which something – software, hardware or anything else – is easy to use and a good fit for the people who use it.” One way to determine if something is usable is to “test” it with the intended audience. 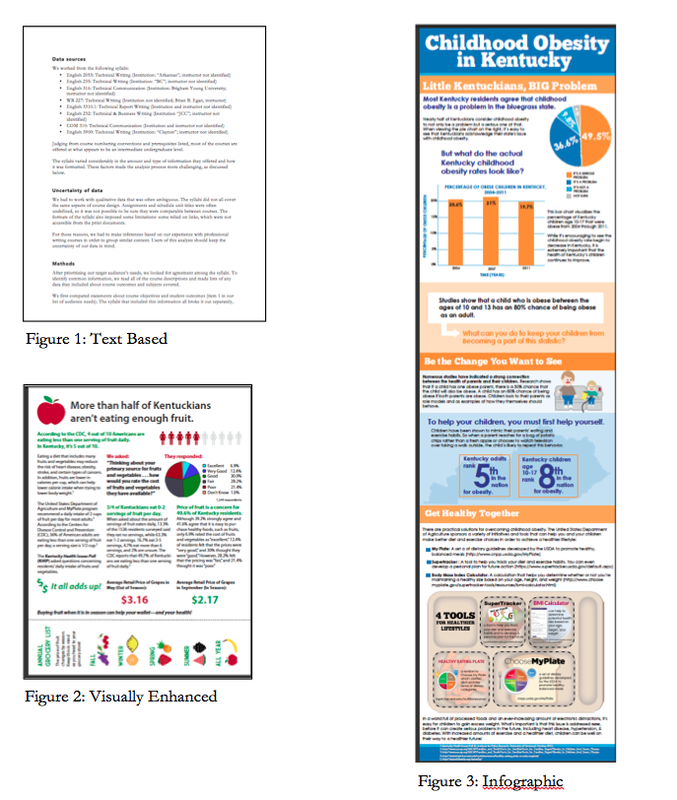 For this project, a research team comprised of three principal investigators, will use a triangulated research methodology to test/compare a typical, text-based document (Figure 1), a visually enhanced version of the text-based document (Figure 2), and an information graphic of the same information (Figure 3) to determine how well each attracts reader attention and fosters reader’s comprehension of the information. Review the same data displayed using the three different formats of information design (Figures 1-3). Summarize the information conveyed via each format to determine comprehension and readability levels of each sample. Through one-on-one interviews with subjects, the research team will gather qualitative data about which visual representation was the most comprehensible and why. We will use an Eyeguide mobile tracker eye-tracking device to monitor how readers review the same three kinds of documents to gather quantitative data about where users actually look on a page or a screen. This quantitative data helps us understand how individuals locate information, how long they stay on a certain feature, and what features draw the most visual attention. This data will also help us understand best ways to produce visual representations and how to incorporate those representations into documents for lay audiences. Methods 1 and 2 would be done simultaneously. 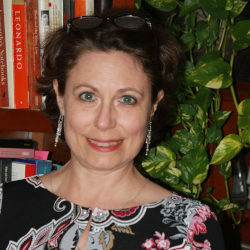 The central idea is technical communicators need to simultaneously collect quantitative data on attention and qualitative data on comprehension for the same item (St.Amant & Meloncon, 2015) to test the ability of an item to attract the user’s attention and determine how well users comprehend the information being presented. We will conduct focus groups to further identify what information design features best-enabled comprehension of the data. This allows us to gather additional qualitative information on perceptions, preferences, and expectations related to the readability of documents. This triangulated approach using both quantitative and qualitative methods ensures the rigor, validity and reliability of the study, and it also lays the groundwork for replication studies to continue to test and modify the attention-comprehension gap theory. Research participants will be recruited from existing relationships with community based projects in Ohio and Southeast Texas. What is unique about these community based projects is that each represents a specific under served population, which will hopefully lead us to answers about solving issues around health disparities and information delivery. Note: Figures 1-3 are samples and are not meant to represent the actual data that will be used. They are meant to show the different types of information design that will be used. What’s the significance of this project?